The northern mountainous province of Ha Giang will hold a Cultural Heritage Tourism Week of the Ethnic Minority Groups from November 19-23. Chairman of the provincial People’s Committee Dam Van Bong said that the event, which will take place across several Ha Giang districts, aims to honour the value of its intangible cultural heritages and promote province’s tourism products and potentials to local and foreign tourists during the five-day event. Visitors will have the chance to enjoy special art performances and the province’s traditional cuisine, as well as take part in folk games and a fire dancing festival of Pa Then ethnic minority group in Tan Bac commune, Quang Binh district. 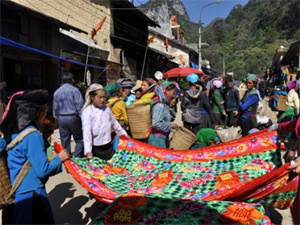 They can also learn how to weave brocade products with Pa Then ethnic people and visit the province’s well-known and beautiful sites such as the Dong Van Stone Plateau – a member of the Global Network of National Geoparks, Lung Cu flag pole and Ma Pi Leng pass. The opening ceremony will be broadcast live on Vietnam Television (VTV).